The Red Ledges community in Heber City, Utah (about 20 minutes from Park City) is a master planned community designed around a Jack Nicklaus signature golf course. The community covers over 2000 acres (it actually nearly doubled the size of Heber City when the area was annexed into the city). The master plan calls for nearly 1200 homes in a recreational focused community. While the golf course is a centerpiece of the Red Ledges community with its 18-hole course, and a 9-hole “short course”, it's so much more than that. Nestled in the red rock, desert-like terrain. The Village Center portion of the Red Ledges community is truly the centerpiece of the development. The village center is walking distance to the planned Cliff Drysdale tennis academy. It is slated to be the first if its kind in the western United States. The tennis center features hard courts and clay courts indoors and outdoors. The Red Ledges community has many public equestrian trails running around the community’s boundaries and throughout the 400 acres of open space. There is a full equestrian center located on the southeastern end of Red Ledges. The equestrian center has both indoor and outdoor riding arenas as well as horse boarding for club members. A private ski chalet at Deer Valley Resort is also in the works for the Red Ledges community owners. Deer Valley, the number one rates ski resort in North America is only 10 minutes from Red Ledges. Snowmobiling, snowshoeing and cross country skiing will also be available to Red Ledges owners during the winter months. 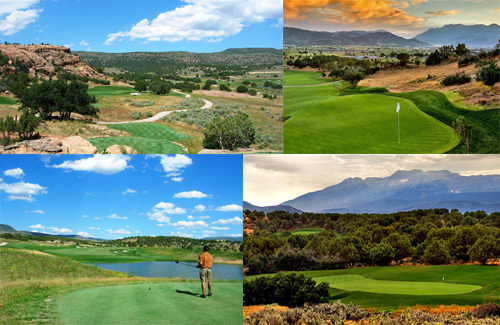 There is a (Jim) McLean Golf Academy also slated for the Red Ledges community. This teaching academy should draw students to the area from around the world. The driving range and short game facility are already in and ready for use. From the looks of it, it will provide a great working space for the teaching academy. All owners at Red Ledges will have a “lifestyle membership” providing access to club amenities other than golf including: tennis, swim club & fitness facilities, spa, ski lodge, adventure cabin, kids’ camp, and clubhouse dining. There will be only 400 golf memberships. So while there may be 1200 residences when the development is complete, only a minority of owners will have golf memberships. The overall community will provide a much broader four season focus.